Obituary – DeLashmutt, Harry Acomb « Perry High School Alumni Association, Inc.
Harry A. DeLashmutt, 88, who was in charge of the accounting department for The Perry Daily Journal for 39 years, died about 2:30 p.m. Thursday, May 30, 1974, in Perry Memorial hospital where he had been a patient since Sunday night. Funeral will be at 3 p.m. Saturday in the Parker chapel with Rev. Don Harnden, pastor of the First Presbyterian church officiating. Burial will be in Grace Hill cemetery. DeLashmutt had been in failing health about four months, but remained active. He was at his desk last Saturday. He was born Nov. 11, 1885, in Oskaloosa, Iowa, and came to Perry about 1900. He was a graduate of Perry high school. 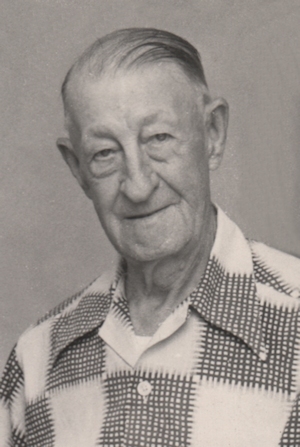 He was cashier of the Farmers and Merchants bank in Perry in the late 1920s and early 1930s. He joined The Daily Journal in 1935 and has held the accounting position since. He was a former member of the Perry city council and a past president of the Perry Golf and Country club. He was an active member of the Presbyterian church. DeLashmutt was a 32nd degree Mason and was honored by the local Masonic lodge last year when he was presented his 60-year pin. He was an avid sportsman, both in participation and interest. He was known as a consistently low-scoring golfer and was on the local course for a time about 10 days before his death. He was also a regular participant in bowling. In legal circles he was known for his understanding of legal publication laws and local attorneys depended on his knowledge in handling publications in The Journal. He was married Oct. 1, 1911. Mrs. DeLashmutt preceded him in death Oct. 2, 1972, the day following their 61st wedding anniversary. Survivors include one son, Harry A. DeLashmutt Jr., of Colorado Springs; two granddaughters; one grandson and three great-grandchildren. Casket bearers will be Keith McQuiston, Ernest Stoops, Gene Taylor, Milo Watson, Kenneth Coldiron and George Chitwood.